Chuck E. Cheese's is a pizza restaurant as well as an entertainment center. There is much more than pizza to be enjoyed at Chuck E. Cheese's. Fun and games with prizes and a show that features giant animatronics have propelled Chuck E. Cheese's into a giant of family entertainment restaurants. Jeepers! Inc. is an indoor animated theme park designed for children 12 years and under. With an offering of amusement park rides, games, and food, Jeepers! is a wonderful place for families to enjoy time together in a climate-controlled environment. The founder of Atari, Nolan Bushnell came up with the idea for a restaurant coupled with an amusement park, and Chuck E. Cheese's Pizza Time Theatre opened in San Jose, California in 1977. Chuck E. Cheese's bought out Showbiz Pizza Time in 1984 and the two brands became Chuck E. Cheese's Pizza. In 1994, 'Pizza' was dropped from the name. Jeepers! was originally called Jungle Jim's Playlands, Inc. in 1988 when it was founded. Based in Massachusetts, Jeepers! has more than 17 amusement parks in the United States. Chuck E. Cheese's menu has changed significantly in the past few years to offer a more nutritious variety. Not only will you find pizza and hot dogs, but also oven roasted sandwiches and apple juice. Beer and wine are even available at some restaurants for parents to enjoy. With over 500 locations across the United States, Canada, South America, and even the Middle East, you can find a Chuck E. Cheese's almost anywhere! Jeepers! offers nachos, hot dogs, Caesar salad, and french fries for starters. Pizza, cotton candy, and ice cream are available as well. The variety of food is not as extensive as Chuck E. Cheese's, which may not appeal to parents, but the menu is definitely designed with children in mind. There is a Jeepers! Junior center inside a Toys 'R Us store is Elizabeth, New Jersey as well as one in Fairfax, Virginia. Chuck E. Cheese's mouse mascot is very well-known. The mouse is joined by the lesser-known Crusty the cat (retired and replaced by Mr. Munch), Pasqually the chef, and Jasper T. Jowls. Some stores have changed the show to live shows or no shows at all, but all of the stores still have Chuck E. Cheese as the mascot. Jeepers! has J.J. the orangutan, Trish the hippo, and Kronkle the dog. Amusement park rides incorporate the characters, such as J.J.'s Monkey Mayhem spinning barrel ride. Other rides include the Himalaya El Paso Train and there are more than 70 arcade games such as skee ball and Wheel of Fortune. 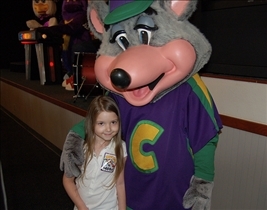 Chuck E. Cheese's has long been known as a place where kids can be kids. Arcade games are the main attraction as children can not only play an enjoyable game, but also earn tickets that can be traded in for toys and prizes. An innovative family restaurant idea, Chuck E. Cheese's has a few imitators, such as Dave & Buster's, which is geared more for grownups. Jeepers! Inc. is a smaller indoor amusement park/restaurant venture that is in many ways similar to Chuck E. Cheese's. The idea for wholesome family fun incorporated into an indoor amusement park is a new spin of Chuck E.'s games and animatronics show and is as entertaining for children at the very least. I like both, but I used to go to the now closed Jeepers in Baltimore, MD almost all the time since it was closer than Chuck E. Cheese.